“These members have shown a commitment to building an environment where individuals and small business can succeed,” AFP state director Jesse Mallory said in a statement. “Through their hard work in Denver, more Coloradans are realizing the benefits of a smaller government footprint in their everyday lives. And they must continue their focus on removing government barriers that impede success and implement policies that empower individuals. 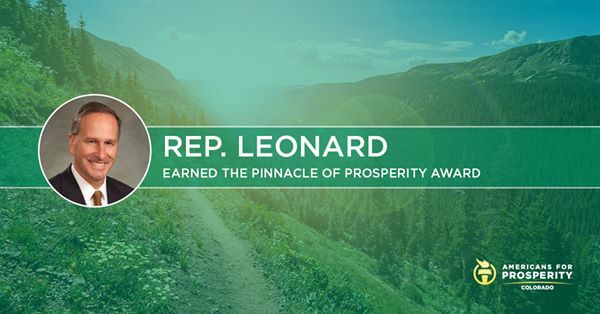 Because AFP Colorado given a “Pinnacle of Prosperity Award” to none other than Rep. Tim Leonard of Evergreen, one of the worst examples of an “own goal” in recent memory. As we’ve had the unfortunate duty of recounting in this space, Leonard’s idea of giving kids “the attention they deserve” consisted of going to jail for contempt of court in 2016 rather than cooperate with his ex-wife on his kids’ educational needs. Last month, Leonard attempted unsuccessfully to reduce his child support obligations by claiming his work as a legislator–yes readers, that “hard work in Denver”–was too time-consuming to keep his secondary employment. It doesn’t matter how Rep. Leonard may have scored on some list of votes. By giving Leonard this award after he shamed his office and the Colorado General Assembly as a whole, trying to use his elected office to cheat his own kids, AFP has taken proud ownership of one of this year’s biggest disgraces in Colorado politics. "It doesn’t matter how Rep. Leonard may have scored on some list of votes." Actually, that's what the whole thing is about. Nice try Pols. Truth? Stay as far away as you can from that dangerous idea! … as long as you vote the way we tell you to, that's all that matters. Nice try by Moderatus. As I recall, Americans for Prosperity was told to "get the heck out of my district" by State Senator Larry Crowder (R-Alamosa) duing his last election campaign. I suppose that local AFP hasn't gotten the message yet that their big funders, the Koch brothers, are no longer enamored with Donald Trump and his anti-free trade & pro-tariffs lap dogs. Talk the talk on family values, but you don't have to walk the walk on family values. Why didn't they use the more easy-to-recognize photo of Tim Leonard in his Jeffco Jailhouse orange? A Pinnacle of Prosperity, who had a judge lecture him about not using his time to make money in commercial real estate. No matter what his VOTES were, the irony of the award is amazing.